A version of which appeared on my instagram a couple of weeks back, just before I took my little collection of rabbits to Knitting Club and handed them over to a friend running a fund raiser for Romania. They were a lot of fun to make: just a garter stitch square pulled together following these clever instructions from Jo Soandsew. I have also been knitting what looks like an enormous grey elephant, but is actually a man sized sweater; and I'm aiming for some scrapbooking this afternoon. But first a catch up, with thanks to everyone who has kept on Monday-ing. Have a good week! They are very cute and a lovely worthwhile cause. Good to hear you are on the mend. Now take it easy this week. Delighted to read that you are on the mend...and the bunnies are too cute! Thanks for sharing and the link...Enjoy Spring! Happy first day of Spring! So glad to hear you are home; rest and relax and take it easy! 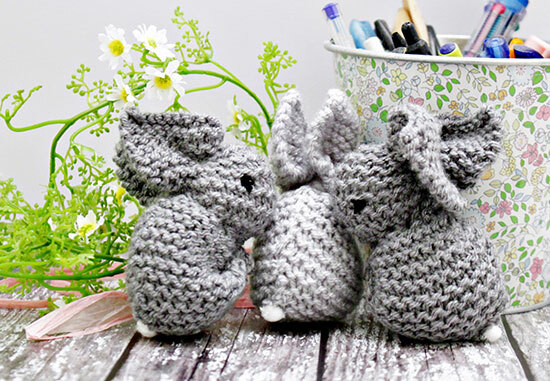 Those adorable bunnies are another reason I wish I knitted or crocheted! Pleased to hear that you are home, safe and sound. Now do whatever the doctors told you to do and if they said rest, they meant it! A nice bit of knitting will normally help recuperation, and a man sized garment should keep you busy for a while. I hope it'll be smooth sailing from here onward for you. That picture belongs to a magazine! Happy to see you home, but do please follow any advice re rest and recuperation. And moving on, those bunnies are super adorable! Adorable little bunnies - sending you some well wishes too! Oh my, those bunnies are adorable. So glad to "see" you back - continuing to pray for a complete recovery and a return to more energy in the coming days!! Hope you're on the up and up. Between you and Him, you've had a rough time of it lately. At least the Irish beat the English. That'd have to cheer EVERYONE in the family up, I'd reckon!!! And it's great to see you knitting both tiny things and big things. I guess knitting would help the time pass nicely - I've been reading like a demon. Dunno why. A fad, I daresay!!! They're adorable! So sorry to read you've had a rough couple of weeks (I need to go back further in my catch up - I started at the most recent) and hope you are feeling more like your usual self now.